Right after Janet and Ian’s wedding at Villa d’Este, Italian Lakes Wedding Team organized another important event: Bianca and Mills’ wedding to Villa dei Cipressi in Varenna – East side of Lake Como. Have a look to Bianca and Mills’ photo gallery realized by photographer David Christian Lichtag. Lake Como recently arouses a certain emotion on people coming from the States. In the last few years famous people like Brad Pitt, George Clooney, Matt Damon, Angelina Jolie or Sarah Larson visited Lake Como and contributed to let world know the beauty of this magic place, consacrating it as one of the most requested destinations for weddings in Italy and Europe. Bianca and Mills are from Los Angeles, they work in the movie business. Bianca is blond so pretty and charming, Mills is a movie director that, among the other commitments, worked as co-director and producer of Lethal Weapon 2 and 3. This was an exclusive wedding that Bianca and Mills reserved for a small number of friends and relatives. For the organization of the even American couple hired Italian Lakes Wedding Team. Valentina Lombardi was the wedding planner and floral designer Monika Andenmatten from La Piccola Selva Lake Orta. Before the big day they wanted a nice rehearsal dinner in a charming restaurant on Lake shore between Cernobbio and Laglio, just side of the George Clooney Lake residence. All guests arrived by motorboat, there was a long table decorated with lemons and yellow candles in theme of “Lemons in Italy” waiting for them. Wonderful dinner was served with moving speeches in between. For the after dinner again on the boat and dances up to very lake to a pub in Varenna! Wedding day has come! As for the religious ceremony Bianca and Mills chose the evocative baroque church of St Martin in the little village of Perledo on the hills above Varenna. Church was built in 1500 and inside there are important pieces of art just like the precious marble altar of 1700. Couples coming from all over the world love this church because of the stunning view that you can appreciate from there. You can admire green hills and its Vezze Castle and the lake together with Menaggio, Tremezzo and Bellagio promontory. 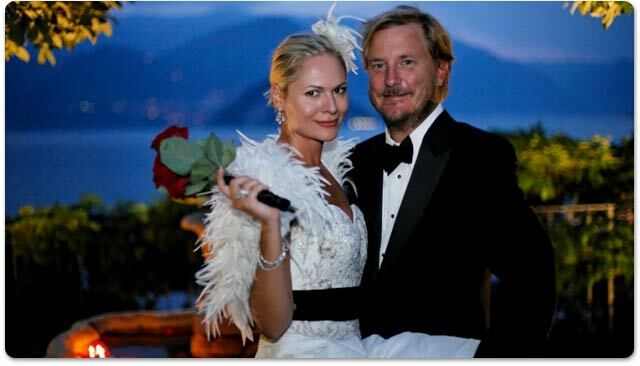 At the end of the ceremony Bianca and Mills and their guests moved to Villa dei Cipressi on Varenna lakeshore. Villa dei Cipressi is a wonderful private home of 1400 restored in a beautiful hotel and wedding venue with a botanic garden with rare exotic plants and romantic degrading terrace towards the lake. Just a perfect atmosphere for an exclusive wedding! The party started with a cocktail in the terrace and a candle light dinner in the garden of the villa. Full moon, thousand of rose petals, candles all over the garden the steps the tables were the perfect frame for an unforgettable, fascinating night on blue Lake Como. A magical event for Bianca and Mills. Italian Lakes Wedding wish them eternal happiness!